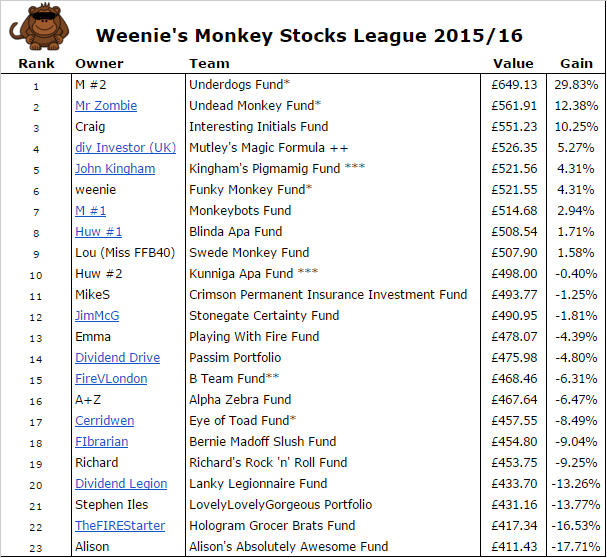 With the stock markets surging this past month, who is flying high in the Monkey Stocks League Challenge? Below is a snapshot as at the close of trading on 29th April 2016 and still leading the pack was M’s Underdogs Fund! This fund has what appears to be a runaway lead, showing a gain of nearly 30%! 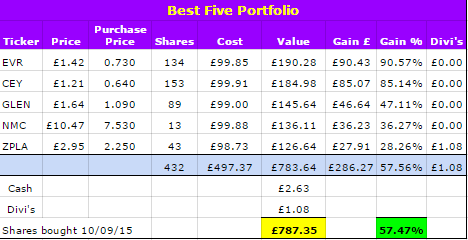 All April dividends have been added to the respective portfolios. However, please let me know if I’ve missed any (or if there are any errors) as there are so many to keep track of. 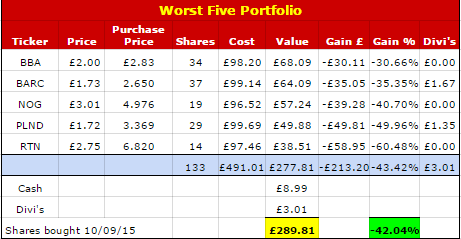 Riding high in the real portfolios behind the Underdogs Fund is Mr Z’s Undead Monkey Fund, with my own Funky Monkey Fund just outside the top 5. FireVLondon’s B Team Fund and Cerridwen’s Eye of Toad Fund still toiling in the bottom half of the table. John Kingham’s Pigmamig Fund props up the top 5, with Huw’s Kunniga Apa Fund moving up the table in 10th place. Will either/both finish above the monkey funds by the end of the competition? Five more months to go with Brexit and whatever else the market has to throw at us – what will they do to the Monkey Funds? This entry was posted in Blindfolded Monkey, Blog Update, Shares by weenie. Bookmark the permalink. Things like casino, lottery and so forth I maintain I have terrible luck which is a good thing as it means I avoid them!